Animal Fencing: To Replace or Repair? This is the time of year when farmers start planning winter maintenance projects. Among those projects is the dreaded task of addressing fences. If you have more than a mile or two of fencing on your property, chances are you are looking at having to repair or replace some of it within the next year. So which do you choose? To replace or repair is a question that has plagued landowners for generations. In a perfect world, repairing animal fencing would be the most cost-effective way of keeping things going without endangering animals or interrupting grazing. But sometimes repairs just don’t make sense. Sometimes it is better to replace broken fencing altogether. We get that farmers have to look long and hard at the cost of replacement versus repair. We also understand that tearing down all your old barbed wire fences and replacing them with modern, electric fences will require quite a substantial financial investment. But you must weigh the upfront costs of replacement with the ongoing costs of maintenance and repairs. We have heard stories of landowners repairing the same barbed wire fences for decades. At some point they realize they do not have a solid piece of fencing remaining on their properties. They have been repairing the fences for so long that they are left with miles and miles of patchwork. How much time and money have they put into those fences? Farmers also have to consider how much labor they invest in fence maintenance and installation. One thing we know for sure is that installing a new barbed wire fence is considerably more labor-intensive than erecting an electric fence. So if you are going to replace anyway, you’ll put a lot less effort into electrified fencing. A decision to repair your fence is sufficient motivation to step back and consider how much labor will go into the project. If you are still using barbed wire, could you affect the same repairs on an electric fence in less time and with less labor? 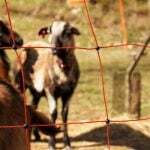 In the long run, will you invest less labor in maintaining a new electric fence as opposed to sticking with barbed wire? We understand that none of these decisions can be made by anyone other than you. We don’t know your situation or circumstances. We don’t know your budget. We don’t know how much time you have to invest in fence maintenance and replacement. What we do know is that modern, electrified fencing has a lot to offer. We think it’s a better long-term solution than barbed wire. In closing this post, we want our customers to know that there is financial help available to landowners looking to install new fencing. As just one example, we ran across an interesting article in Beef Magazine talking about a Canadian organization that offers a cost-sharing program for landowners. They pay to have new electric fencing installed while the landowners agree to pay for all future upkeep and maintenance. Closer to home, there are occasional grant programs available at both the federal and state levels. For farmers who rent their land, there is always the option of working with the landlord to see if a cost-sharing deal can be worked out. Landlords are often willing to contribute to new fencing once they understand how important it is to keeping property value stable. Regardless of your choice to repair or replace animal fences, know that Mytee Products carries a full inventory of electrified fencing products. We invite you to take a look at our inventory here online.